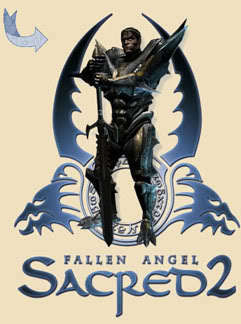 Sacred Underworld and Sacred 2: Fallen Angel written and maintained by the players. Ice and Blood Expansion - New Dragon Mage class, Quests and Enemies! Ice & Blood Map of Ancaria - New Crystal Plane and Cursed Forest regions. Community Patch - New sets, quests, cool new drops and fixes! Diablo 2 Fallen - New mod that completely transforms Ancaria and its characters. Sacred 2 Downloads - Download blank characters, builds, items and more! Game Summary - Technical specifications and general overview. Features - Key features and game modes. Quests - More than 600 quests to solve! Listing and guides. Graphical User Interface - Nice new game controls. Game Options Menu - Make your game look and act its best. Backstory - The myth, lore, and history of Ancaria and T-Energy. Sacred 2 Map of Ancaria - A zoomable map and how to use the game's map functions. Sacred 2 Dungeon Map of Ancaria - Your guide through the deeps! Deities - The six game gods and their powers. Items - Index and commentary on Weapons, Set Items, Uniques, Legendaries, Standard Armor and more. Item Modifiers - The modifiers you can find on the various items. Runes - Listing and description of runes. Forging - Explanation of blacksmith socketing of items. Mounts - All about unique mounts and horses. NPC's - List of all the types of non-player characters you may interact with. Game Glossary and Abbreviations - A comprehensive reference for Sacred terms and lingo. Ingame Tooltips - Complete listing and pictures of ingame tooltips. Portals - Portals and mini-portals, how they work and where to find them. Ships - Your guide to fast travel over land and sea. Character Class - The six characters and everything about them. Combat Arts - Index and description of all combat arts, aspects, combat art mods, and buffs. Character Attributes - The six attributes and what they do. Skills - Skill choices and effects for characters. Combat and Game Basics - Basic game mechanics explained. Achievements and Trophies(PS3)- Explanation of titles characters can acquire. Bestiary - Complete enemy list with pictures. Regions of Ancaria - Regions and descriptions. Places of Ancaria - Quaint little towns and deadly lairs. Statues - Bonuses some statues bestow onto players. Temple of the Gods - Find a moment to ask the blessings of the gods. Races - Listing and descriptions of races in Ancaria. Books - A library of all the attainable books. Heraldry - Flags, banners, and insignia of all the races and factions. Art of Ancaria - A showcase of all the paintings, sculptures, and artwork created by Ancaria's denizens. Screenshots - High-resolution screenshots from Sacred 2. Video Garden - In-game videos and game animations. Renders - High-quality character and creature renders. Fan Art - Drawings and illustrations contributed by players. Artwork - Early sketches and designs. Box Art - Box art that rivals the best. Wallpapers - Official Sacred 2 Wallpapers. Avatars - Official Sacred 2 Avatars. Sacred 2 Player Contributed Guides - Helpful guides for planning your character builds. Sacred 2 Modding - Changing Ancaria as we know it! Silly Messages - Complete listing of start-up messages and puzzle-poems. Community Grave Messages - RIP: Funny ways to go six feet under. Easter Eggs - Listing of Easter Eggs found within the game. Sacred 2 Fan and Clan Sites - Compilation of Fan and Clan Pages. We are currently maintaining 24,712 articles. Register - If you want to contribute to SacredWiki, please register an account at www.darkmatters.org. All are welcome and encouraged to participate by adding or editing content. How to help - A successful wiki relies on the contributions of many, many people. Check out the How to help page to see how you can contribute to the wiki. Policy - Please go over our site policy before you start making contributions. Style and formatting - Formatting templates. This page was last modified on 25 February 2016, at 21:25.